Elko Nevada was bustling early February and it wasn’t just due to the annual National Cowboy Poetry Gathering. The excited anticipation of the opening of the new Cow- boy Arts and Gear Museum also brought in some colorful characters. The museum, which was a two year labor of love, was the partnership of John and Susan Wright of J.M Capriola and NVEnergy with John’s mother, Paula in mind. “Initially this was a dream of Paula’s. She knew that the building was Garcia’s home and shop. I’m just so pleased we could bring it to life in her honor,” John Wright said. The museum is four doors down from J.M Capriola Co. in the old G.S. Garcia building in historic downtown Elko. The museum building, at 542 Commercial Street, was once the center of the community where ranchers, miners and businessmen could appreciate the business G.S. had created. G.S. Garcia moved from California in the late 1800s to Elko where he immediately saw the need for exceptionally made gear in the Great Basin area. His gear quickly became some of the most sought after and recognizable gear on the market. Demands were high. In the early 1900s the family business moved back to California and stayed there until the 1970s when J.M Capriola acquired the business and brought it back to Elko. The grand opening was nothing short of grand. The museum, which was lled wall to wall with visitors, was buzzing in awe and appreciation. “Everyone who walked in was touched. Doesn’t matter your age, this museum is truly for everyone,” Wright noted. 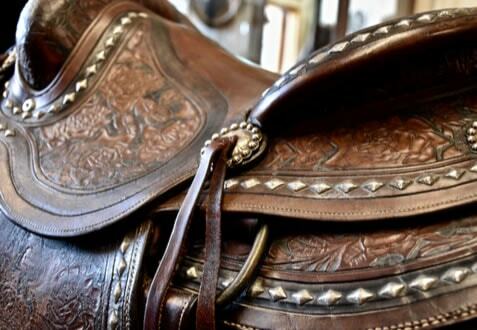 As you walk through and see the many beautiful bits, spurs, saddles and other cowboy gear, much of the collection from the Garcia vault, you can’t help but smile at the American artistry that has inspired many today. In the future, John and Susan hope to host gear building classes on the second floor of the museum. Wright says their goal is to “encourage and preserve the arts”. They hope to have saddle, bit and spur mak- ing classes, along with other trade classes that the museum’s audience appreciates. You could nd just about anyone among the crowd of folks who attended the event from the traditional cowboy to next-generation enthusiasts. Even the granddaughter of Garcia himself attend- ed the event. You could even nd The Outside Circle, a crew of musicians that celebrate the art of the cowboy lifestyle, who ended up playing a few impromptu tunes outside the museum. Deemed the “guardians of tradition”, John and Susan emanated the feeling of gratitude towards all that helped bring this dream to life. That feeling brought collec- tors and artists together for their apprecia- tion of this art and lifestyle. “Cowboys are never thought of as artists but most of them are… to the core!” exclaimed Wright. 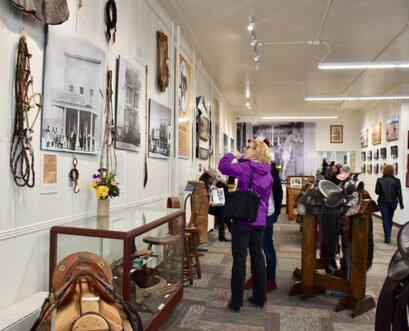 The museum opening is not the beginning or end of an era but merely a continuation of the preservation and appreciation of the ranching and cowboy lifestyle. The crowd at the opening made that apparent. The current exhibit of Garcia memorabilia is one you shouldn’t miss. Many congratulations and thanks to the Wrights, NVEnergy and all who contributed in making this happen, continuing this wonderful piece of history and keeping ranching nostalgia present. PHOTOGRAPH COURTESY OF CRISTINA FAULCONER : The Outside Circle entertained attendees with an impromptu performance just outside the museum; An incredible saddle on display; Western and ranching memorabilia on display at the Cowboy Arts and Gear Museum in Elko, Nevada; Attendees wander, read and admire the heritage of G.S. Garcia, a legendary entrepreneur and craftsman who created in the very building the museum is located today from 1894-1933.